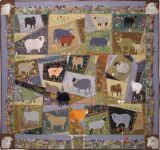 A pattern featuring 20 sheep and rams, a border collie to keep them in line & watch over them, a fence to border the field of crazy quilt scraps, and four faces (for the cornerstones of a quilt). Two of the sheep have slubby wool yarn coats. I looped the yarn up and down in rows (starting at the belly of the sheep) and zigzagged with the sewing machine across the top of the loops of each row. This cotton quilt in the photo above measures 33" x 57". You can make your quilt any shape. In 2008, I discovered the felting needle and wool rovings (see the photos below for the results). Felting can be done through cotton fabrics with no problems. However, using wool suitings will take this pattern to a different level. 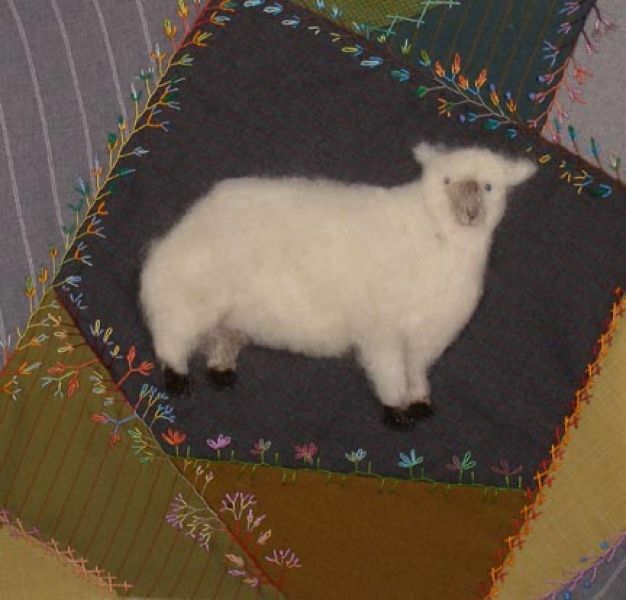 This pattern that was used for the sheep in the pattern Crazy Sheep. 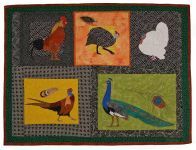 That pattern shows how you can take any of our patterns and run with them using hand embroidery and felting and wool fabrics. This is not similar to running with scissors! It is fun to push the envelope.When you order a PDF pattern, the download location will be sent within 24 hours of placing your order. You could use this pattern (or any of our patterns ) to make felted appliques like this one.